Amber Heard is seen at a luxurious hotel after apology video. American actress, Amber Heard who has been in the news for not-so-good reasons was spotted at the luxurious Palazzo Versace Hotel on Queensland’s Gold Coast on Tuesday. The actress looked relaxed and pleasant since the actress didn’t face any serious charges on Monday for illegally smuggling dogs in Australia in May 2015. She was pleaded guilty for falsifying border protection documents, however, no serious charges of illegal importation were pressed against her and she was exempt from possible jail time. The actress was seen in a casual ensemble; a black t-shirt and high-waisted jeans accessorized with rounded tortoiseshell sunnies and no make-up. Nine News reported the couple was even spotted 'donning bathrobes and sharing a celebratory cigarette' as they were hold up in their luxury accommodation. 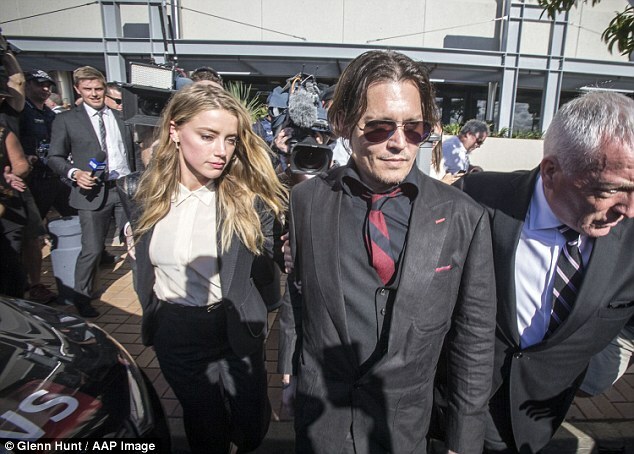 The Australian Government Department of Agriculture and Water Resources released an apology video of Johnny Depp and Amber Heard on ">Youtube. The video was shown to a Gold Coast court before a magistrate hit Amber with a one-month good behavior bond and a $1,000 fine over the debacle. Heard, 29, who reached a deal with prosecutors, pleaded guilty to one count of falsifying border protection documents after they dropped two charges of illegal importation. Heard's lawyers told the court on Monday that the pair agreed to produce the video in order to 'achieve some public good'. In the video, Amber was heard praising Australia. Although the apology video was supposed to be a serious one, the video does not give any serious vibes. The video which was published on Monday has become a subject of mockery throughout the internet. Depp is very underrated as an actor. That performance of 'man loathing every second of being forced to do this' was utterly convincing.